Lincoln is a smart, insightful, emotionally stirring, and highly relevant historical drama with mesmerizing performances and outstanding writing. It is one of the best films of 2012. President Abraham Lincoln is, for obvious reasons, one of the toughest historical figures to get right on film. The breadth and impact of his accomplishments is a deep and multifaceted conversation that cannot be taken lightly, and his legendary personality, image, and speaking style are so deeply ingrained, through a variety of interpretations, that defining him in truly revelatory ways is destined to be an uphill battle. Even with Steven Spielberg and Daniel Day-Lewis attached to the project, a dream team that would excite me no matter what the subject matter, I walked into Lincoln with minor trepidations, wondering whether any creative force, even this one, could craft a film worthy of the President’s legacy. I am overjoyed to report, then, that Spielberg and company have turned in an absolutely spectacular film, one that mines deeply into Lincoln’s psyche and personality, but even deeper into the raw emotions of a broken, bitter, and seemingly unmendable America. This is a film set in the past but made for today, a story of our nation at its best and its worst, and a powerful reminder of how far we have come and how far yet we have still to travel. The film picks up just before Lincoln’s second inauguration, when the President has decided that, with his final election behind him, it is time to do the right thing, politics be damned, and push the 13th Amendment through Congress. It will not be easy. America is more divided than ever, and though he cannot make people change their beliefs, he can use his unique gifts of oration and insight to work within a damaged system and get the ball of social change rolling. 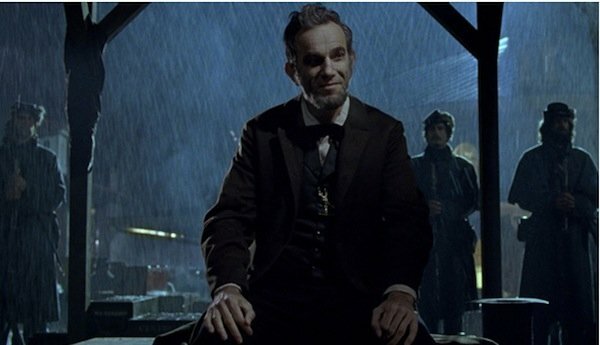 This is Lincoln’s goal, the objective he shall accomplish no matter what, and I think Spielberg and screenwriter Tony Kushner have made an excellent choice centering the entire film around this crucial political battle. The story of how Lincoln and his allies passed the 13th Amendment defines who the President was better than a point-by-point recreation of his life ever could, for it is the moment where his personality, beliefs, and leadership were tested to their fullest extent. Freeing the slaves once and for all meant bending the rules, breaking political codes, and pushing the power of the Executive as far as any President to date, but Spielberg argues – with good reason, I believe – that momentary betrayals of human institutions are acceptable when the good one fights for stems not only from a higher power, but from the founding principles of the very nation in question. Lincoln was a historically great President because he acknowledged our country’s imperfections, and was willing to sacrifice political points and standing to ensure that we upheld the principles of freedom and equality laid down in our founding documents. This is a lesson we would all do well to remember, as modern America also stands at a crossroads in extending freedoms and addressing inequities. Spielberg’s Lincoln is a powerful reminder that although doing what is right, regardless of politics, is never the easiest path, history will bear out that a belief in the best of humanity – all of humanity – and a belief in change as a power for good, will always trump the stubborn forces of the past. But as excellent a job as Spielberg and Kushner do at placing Lincoln in a broader historical context, the real triumph lies in how intimately they illustrate Lincoln the man, not Lincoln the legend. This Lincoln is a thoughtfully drawn, multi-dimensional character, one who leads with a quiet grace and a real knack for storytelling. He knows how to read people, can enrapture whole rooms with seemingly mundane anecdotes, has a strong sense of humor, and takes his role as President very seriously. He can be a harsh man, especially to his wife and eldest son, but he appears to love deeply, and is driven by empathy as much as anything else. Daniel Day-Lewis illustrates all this and more in one of the very best performances I have ever seen, a tremendously nuanced, compassionate, and most importantly, lived-in piece of performance art. His Lincoln is understandably weary, having worn the pressure of a splintering nation on his shoulders for a full Presidential term, and even over the course of the film, Day-Lewis illustrates, in subtle yet detailed glances, how much Lincoln accepts the pain of others as his own. His speaking style, meanwhile, is miraculous, soft and fatherly yet bursting with power and precision; whenever he speaks, one can hear a pin drop as the audience, like other characters on screen, is drawn into his mesmerizing orbit. It is as if President Lincoln’s spirit has taken over Day-Lewis’ body, speaking to us directly from the annals of history; he is as captivating, enthralling, and insightful as we could ever hope him to be. And while Spielberg and Day-Lewis clearly view Lincoln as a hero worthy of celebration, they are not, by and large, interested in deifying him. This Lincoln is a man, susceptible to our own flaws and failures, but successful for the courage and strength of character that allows him to overcome imperfection. Day-Lewis’ work is the rare historical performance that feels complete, for he is not merely reenacting history, but finding the humanity made dormant by a century-and-a-half of legend building. The crazy part is that, as remarkable as Day-Lewis may be, his is only one great performance in a veritable cornucopia of acting talent. Wonderful, top-notch character actors and screen veterans appear every few minutes, including David Strathairn, Joseph Gordon-Levitt, Lee Pace, Jackie Earle-Haley, Walton Goggins, John Hawkes, James Spader, Jared Harris, Hal Holbrook, and more, all of them doing outstanding work. 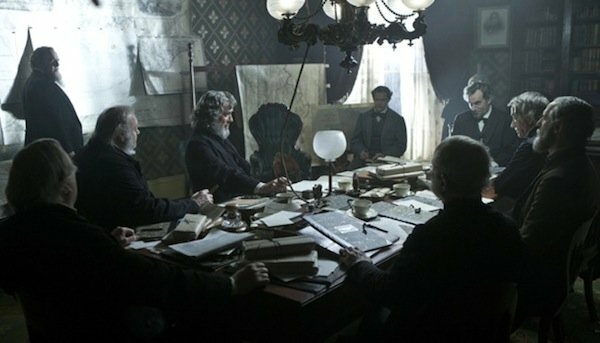 Of special note are Tommy Lee Jones as radical abolitionist congressman Thaddeus Stevens – he lends as much empathy and humanity to Stevens as Day-Lewis does to Lincoln – and Sally Fields as Mary Todd Lincoln, intense, passionate, and compelling in a very well-written part. Spielberg employs a largely stage-driven style, defined by methodical pacing, dialogue-driven sequences, quiet editing and music (John Williams’ surprisingly subtle score is exquisite), and a lack of overt visual flair. The latter is one area where the film could be improved. An understated visual style is understandable, but Janusz Kaminski’s cinematography can border on uninteresting, which is not the goal. That one complaint aside, Spielberg is wise to step out of the way as aesthetic craftsman – though makeup, costuming, and set design are all awe-inspiring – and instead guide the actors towards greatness; writing and performance are the key pieces here, and Spielberg allows both to flourish at every possible turn. I love this movie. I found myself glued to the screen from start to finish, lost in the world created and story told, not just because I am fascinated by history in the first place, but because I believe the characters the film evokes and messages the narrative has to offer are as relevant now as ever before. We stand on the shores of history today, just as President Lincoln and his allies did so long ago, and it is positively life affirming to be so powerfully reminded that those shores can, indeed, be transcended in the most meaningful of ways. Lincoln is one of the absolute best films of 2012.